Creag and Morwenna met while travelling in Australia and share a passion for travel and music. This has lead them, including other places, up Mt Kilimanjaro, all around Europe in a van for 2 years, busking, along the Camino de Santiago with their instruments, volunteering in Kenya, India and the Philippines and now to Nailsworth, a town in South Gloucestershire where they have settled down and now have 2 young boys. Morwenna has played the harp since the age of 12, after seeing a harpist at a school May Festival and convincing her parents that she wanted to learn it. They made a deal with her-they bought her a small table harp and said that if she persisted with it for a year then they would pay for harp lessons. She did, so they bought her some lessons with a local teacher. She enjoyed playing the harp and has gone on to play weddings, funerals, restaurant gigs as well as various art exhibitions, open days and festivals. Creag grew up in a business environment-his parents ran Swallow Systems, a company that made educational robots for schools. With his dad and best mate Steve he made racing robots to compete in Mircromouse, which gave him an appearance on Blue Peter at the age of 12. He started playing the guitar aged 18 while at university in Nottingham. He has never had a face to face lesson, learning all of his songs and techniques from videos online-this is part of the inspiration for this course. He first made a harp in 2012 for Morwenna’s Christmas present, and is passionate about working with wood to make beautiful things-he has also made a bed, various signs, a model of his Dad’s workshop, wine racks. Matt came to luthiery after completing a guitar building course in Totnes. He brings with him a wealth of woodworking and musical knowledge. Matt is a graduate of the University of Wales College of Medicine where he studied Radiography and Diagnostic Imaging. Once qualified, Matt went into pub management and ran several pubs before ending up in Monmouth for 5 years. Whilst at Monmouth he ran a successful music venue that was frequented by amongst others the Pixies, Kasabian and Robert Plant. He plays double bass in a country rock and roll band called Shootin’ the Crow who have played various festivals and gig regularly. Check them out here. He now lives in Dursley with his girlfriend Madeleine and his dog Lupa. 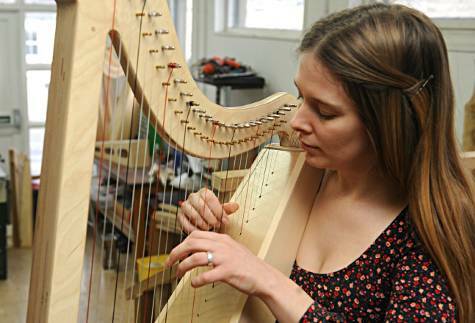 Ellie is our new harp maker and teacher who’s joined us after just finishing her Foundation Degree in Art and Design. Ellie has been creating sculptures all her life and is excited to be moving her practice onto functional designs in wood rather than artistic pieces in clay and plaster. Gael Music (now operating in Glasgow) approached Ellie’s school when she was 13 and found her to be a natural harpist. Ellie has carried on the Gael Music ethos teaching folk music to young people at festivals with Shooting Roots and is now studying for her grade 8 in Irish Folk music on the harp. Our stated aim is to make learning the harp affordable and accessible, but we are proud to make sure that we do that in a way that doesn’t compromise our values. We source our wood only from FSC certificated suppliers. FSC® is an independent, non-governmental, not for profit organization established to promote the responsible management of the world’s forests. We will always pay our employees the living wage. We are accredited by the Living Wage Foundation. We endeavor to make learning the harp affordable. Our aim is not to make gilded, overly ornate lever harps that cost the same as a family car. We want people to be able to afford to get their hands on a harp and have fun with it. We believe that harps shouldn’t be seen as fragile items that people are afraid to touch. Danish oiled wood is quite well protected, and it’s also quite easy to repair if a harp comes back with a few scratches on it. Don’t be afraid to share your music around a campfire! We believe that anyone can learn the harp, and that it should be fun. There is a place for classical training, but it’s not for us-we prefer the folk tradition of training people to be intuitive musicians with a connection to their instrument, rather than automatons who can churn out a piece of sheet music if it’s put in front of them.